The KTLA Morning News has this feature segment where they regularly send a reporter out to local events and establishments and broadcast from there. Two Fridays ago, they visited Puppet School! 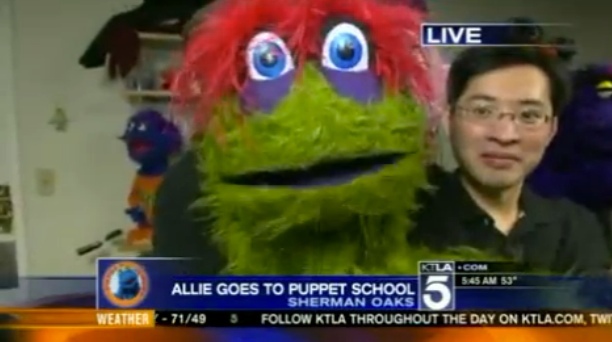 As Puppet School alumni, we got to be in the background with puppets as reporter Allie Mac Kay interviewed our teacher / master puppeteer Michael Earl. Though I had to wake up at 4am to be there for the news that’s live from 5 to 8am, it was a totally fun experience. And yes, Allie is like that on and off camera. One of the student in the background is a huge fan of KTLA Morning News and Allie, so she was so excited to be doing this. We got a puppet version of the meteorologist Henry DiCarlo, and a puppet version of Allie. And many more puppets in the background. After several years of classes and three different stage productions, we’ve certainly accumulated quite a few puppets. I ended up grabbing a different one for each segment. (And they all happened to be green. I realized that just now.) You can see me as the camera panned across. You should be able to pick me out. I am the Asian one. Haha. It looks like you guys are having a total blast! I watched the 7 o’clock segment. Love the mohawk! @Sara: Hehe. The three segments are pretty similar, but I probably had the most camera time on the 5am one, probably because I happened to have grabbed one of the bigger puppet there. Michael Earl has quite a few credits. He was also the left hand of Cookie Monster. When I saw that he was teaching a class, I looked at the credits and thought “I’ve got to sign up!” I wouldn’t say that I am great at everything, but when I watched myself, I realized that all that training and performing experiences did help me develop certain instincts when I am in front of a camera or audience. Hi Sarah, thanks for swinging by even though there has been no post for a while! I shall write something soon. Kelvin Kao recently posted..I am on TV! Hello! I found your post through a comment you made in another blog. I watched the video with the song from the “Les Miserables”.I must say it was really nice. You were good with the puppets. I found some of the other students weren’t so good with the eyeline, but you had your puppets looking right into the camera. I think they just weren’t paying as much attention to the camera as I did. I figured, hey, they are here to shoot something interesting. Let’s give them something interesting to shoot! I think it’s always great to study Elmo’s World. He just wants all the attention and you can learn a lot by watching him play with the camera. This is great stuff, Kelvin. I love how you bring the musical theater element into puppetry with the Les Miserables song — puppets seem to be having a renaissance with shows like Avenue Q, Team America, and so on (although those are not quite in the same style you do, it looks like ). Looking forward to more of your work. Yeah, and there’s the new Muppets movie. It seems to be making a comeback. I would love to see more of them.